I think we can all agree that one of the best parts of summer is enjoying a barbecue on the deck, cold beer in hand, friends, and family. But for that to happen, you need to have a good-looking deck. And if you’re going to get yourself a deck, you should probably stain it. And if you are going to stain your deck, you should probably keep reading so that you know what to look for in a deck stain sprayer. Using a sprayer when you’re staining your deck won’t just save you time, it’ll make the finish that much better. Maybe you’re a DIY-er who is serious about making his work look as good as a pro’s. Maybe you’re a professional contractor who wants to make sure his customers are happy and keep coming back. Either way, if you have a deck to stain, you should invest in the best sprayer for stain. These are the main types of paint sprayers you will come across. Let me just go over the basics for those who don’t know. A conventional air sprayer uses compressed air to spray paint or stain. It is messier than the other two and has more overspray, but it’s also cheaper. Linked to being messy, it also uses the most paint, which means that running it is actually more costly. The HVLP (High Volume, Low Pressure) systems are an upgraded version of the conventional paint sprayer. It uses less stain and the stain is sprayed at a lower speed giving you more control. This is why the HVLP sprayer is best for small, detailed jobs like furniture, kitchen cabinets, or woodworking. An airless sprayer is better for larger area projects. For bigger surfaces, it is a good thing for the paint to come out at a higher speed since it allows you to move faster across the area. Higher pressure allows it to spray more paint at once, meaning an airless sprayer will finish the same area as an HVPL sprayer in a fraction of the time. This type of sprayer is recommended for larger projects so it makes the best sprayer for deck stain. Once you have decided on the type of sprayer you will be using you should see how easy the different types are to use. Look at things like hose and wire length, ease of cleaning and maintenance, and portability. As with most things, when it comes to paint and stain sprayers, you get what you pay for. Invest in a good paint sprayer that will last you longer and give you a better finish. You don’t want to end up spending time and money on staining your deck only to have to start over after the deck turns out spotty. 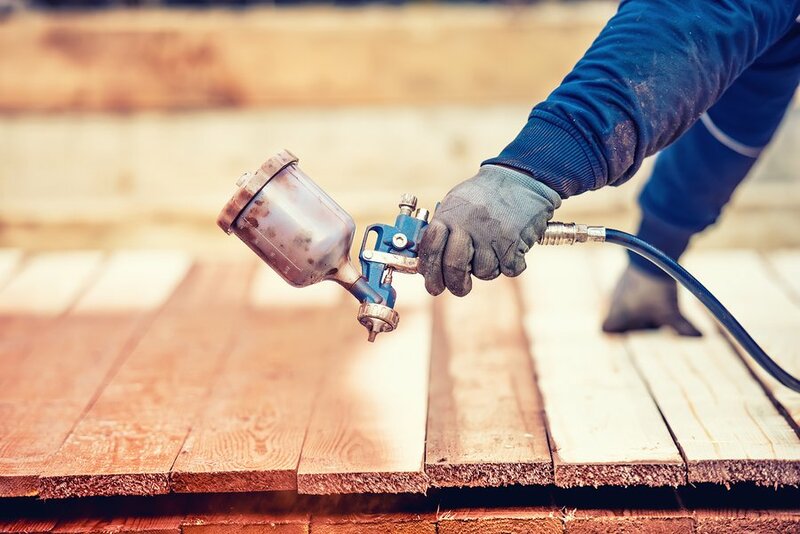 Make sure the sprayer has been made using high-quality materials to withstand wear and tear. You will want to find a model where you can adjust the amount and speed of the spray. That way you can adapt to whatever projects you need, even beyond your deck. Stains are relatively thin and you will get a better finish with less speed so you want to be able to adjust down the power. If you are staining an entire deck you want to make sure the sprayer is efficient. Here the rule is the more power the more speed. Delicate projects like furniture finishing’s, a sprayer that releases stain at a high speed may not work, but for a deck, it’s what you need. An airless sprayer is going to get the job done quickly. You may be buying a sprayer to use for staining a deck, but keep in mind that you may want to use it for other paint jobs in the future. Look for a model that is not just the best deck stain sprayer, but will also do a good job painting a wall for example. The one I have found to be the best sprayer for deck stain is the Wagner 9155 Twin Stroke Piston Pump Paint Sprayer. The producer, Wagner, is one of the top players in the paint sprayer industry. If you have any experience with paint sprayers, you have probably already heard of them. They are known for making good quality, reliable products that are used for residential and commercial projects alike. This model is an airless stain sprayer, which makes it perfect for outdoor, large surface projects like staining a deck. It has a convenient 35-foot hose that makes it very user-friendly. The metal spray gun swivels making it easy to use, even when you need to reach areas that would typically be hard to get to. It comes on a cart with 8-inch wheels and an extendable handle, making it super easy to move around. On the cart, there is a 5-gallon pail bracket for those big projects. The sprayer can handle up to a 0.017 spray tip, allowing you to use it to paint or stain huge surfaces in little time. The 5/8 HP engine can go up to 3000 PSI and can spray up to 0.33 gallons per minute. It comes with a reversible 0.015 spray tip, which can help in clearing out clogs. The sprayer has been made using high-quality materials that will last you for years. It is not a cheap product by any means, but considering the quality of it and the amount it can save you in not having to hire contractors, it is priced very reasonably. Now let’s get down to the details of this product. We can start with the negative to get it over with. There aren’t many so it should be quick. Some users mention that the sprayer takes a long time to clean after being used. Since you should ideally be cleaning it after each job, you have to take that into consideration when you plan how long it will take. The long hose means that the will be some product lost at the end of the project when you go to clean it out. When using the sprayer for larger projects, this model has a very quick cleanup time. There are many positives when it comes to this product. For example the ease of transportation, the strong engine and the quality of the design. It is easy to use and comes with a very clear manual. There are many other sprayers on the market with similar products by other companies. The Wagner PSI Twin Stroke Piston Pump sprayer has a longer hose, making it more user-friendly. It also tends to last longer because of the good quality parts that go into the products. Judging by the feedback from users, this sprayer is also less prone to clogging than others. It is more efficient since it is able to pump out more paint or stain per minute (ultimately saving you hours of work). Price wise, it is comparable to the other similar products out there and well worth it. The best stain sprayer must be used on a deck if you want it to look great and last through sunshine, rain and more. I would definitely recommend the Wagner 9155 3000 PSI Airless Twin Stroke Piston Pump Paint Sprayer to anyone who is planning to stain a deck and wants to invest in the best sprayer for stain.